A lot of business owners who think marketing, start with tactics: email campaigns, website design, LinkedIn and promotions. Truth be told, most well-known marketers do the same thing. But today, I want to affirm that marketing doesn’t start with tactics, it begins with strategy. When you don’t have a strategy to dictate your marketing efforts, then you’re just going to hope, guess, spray and pray about what tactics you should be implementing as part of your marketing. Today, we’re going to look at the strategy steps you need so that you can dictate your tactic steps. Chances are that today, you’re committing this strategy mistake of trying to be “all things to all people”. For example: If you’re a small business marketing firm, your ideal client is not just anyone who owns a small business. Sure, some of them are, but what makes a client ideal for your specific marketing approach? If you offer marketing services as an on-going package that’s a lot different than the digital agency, who promotes and sells only websites or advertising, then the small business owners who would want to go with this one and done option are not your ideal client. But maybe you have marketing services that are best suited to small businesses with a holistic marketing need — like an existing business who has lots of outdated marketing materials, multiple marketing vendors, stagnant newsletters and an online presence that is non-existent. Plus, they’re the ones who’d be willing to approach marketing as a process to get it planned and implemented effectively. Don’t guess about who your ideal client is. It is possible to have multiple ideal clients, just make sure that you develop targeted marketing messaging and tactics for each. Basing your work on specific buyer profiles/personas prevents you from sitting in your office just making stuff up, which is the cause of most ineffective marketing. Living inside the marketing strategy world, it’s easy to forget that many business owners still don’t know how to focus their marketing on solving problems rather than solutions. I was speaking to a group of very successful business owners on refocusing their message on problems, not solutions this past week and it was a great reminder that this mindset is still a source of frustration for many businesses. Let’s say you own a tree service business. Your potential customers will automatically assume that you know how to take down trees. But that doesn’t really address the problem the potential customer has. For most homeowners, their biggest problem associated with a home service contractor is about something beyond the basic service the business provides. Homeowners hate having to wait around for their service window. When they hire someone to handle their tree removal, the team leaves tread or wheel marks and stump grindings in the yard. This marketing message should be featured on the homepage of your website. It’s a key element of strategy because it is how you differentiate your business in a way that your clients value beyond your solutions or services. Customers don’t need a description of your solutions or service initially. Sure, once their experience with your business deepens and they begin considering their purchasing options, they’ll want to know the details. But for now, they want to see how they can build a relationship with your firm. Back to the tree service example: If the prospect is looking to get a tree removed, they may not have decided if that’s the best option for them. They may initially just be looking for advice and expertise, thinking there is a workaround that they could choose. The tree service business, then, wants to establish themselves as that local source of expert advice. This is where educational blogs and web pages come in. The tree service business will publish “The Ultimate Think Before You Chop Guide: Alternatives To Cutting Down Trees In Your Yard” — a webpage page that consolidates all of their content around alternatives to cutting down trees into one place. Now, you become their go-to source for guidance on tree cutting. The educational content pages are a way to draw people in who might not even be looking to make a purchase or become a customer. But then, your expertise is what builds a relationship, trust and eventually convinces them that they do need the solution you offer. Customers have buying questions and objectives, and these will change along the various stages of their journey with your business. It’s your job to guide customers through the journey, taking them through the logical steps of getting to become aware of your business, educated about your business, sampling your business expertise, purchasing your business services and referring your business. To make sure you’re providing customers with what they need at each stage, start by asking questions. In the awareness phase, the essential question for a business owner to answer is, “If someone didn’t know about us, where would they go to find a business like ours?” For most businesses, the primary answer to that question is Google. 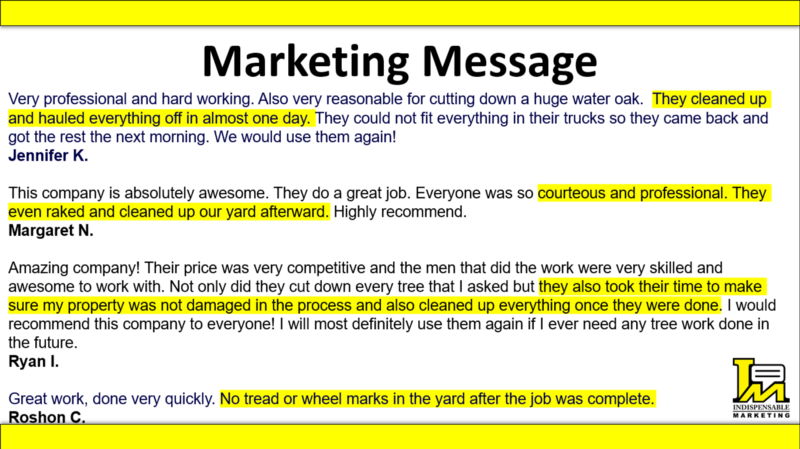 But in the tree service example, you also might have prospects that ask a neighbor for a referral, or see your truck around the community or your signs on people’s property. Once you’ve done that for the awareness phase, you move on to the other four stages of the journey. Once they find your website, what do they see when they get there? Do they see other people trust you? How does someone sample what your business is offering? If you’re the tree service business, that might be getting a quote. But how exactly do they go about getting that quote? Is it a form on your website, or do they need to call or email you? How quickly do you respond? Is the response personalized, or does it feel like a boilerplate offer? These elements all become a part of the customer’s experience and journey with your business. The purchase, and refer stages are more internal. How do you onboard a new customer? What are your team’s checks to ensure that customers are getting the results that they want from your business? What makes a great experience that will bring them back for another purchase or encourage them to refer a friend? This is where you want to get into the buyer’s head to determine what they’ll expect out of you. You’ve now identified the ideal customer, you know the marketing message, you know how content becomes the voice of strategy, and you know how your customers want to buy. Now, you can fill in the gaps to meet customers wherever they are. That is the core of marketing strategy. Tactics are what allow us to fill in those gaps to meet customers where they are. If your ideal customer finds businesses by searching the web, you need to create core content pages so you rank in those search engines. You need testimonials on your website to build trust. You need to be in prominent directories so that you have information in lots of places that prove your legitimacy as a business. You need symbols and badges of trust like client logos. These are the tactics that align with the larger strategy. We have an engagement called Marketing Strategy Consulting, where we do this entire process for our clients. As a part of this engagement, we interview your existing customers and analyze your competitors. We build ideal client personas and establish a marketing message that will speak to them. We map out your editorial calendar and determine how to make content a relationship-workhorse. And we go through the customer journey exercise and identify the gaps in your current marketing approach. This gives you a firm foundation on which to build your tactics and move your marketing forward based on a solid strategy. This entry was posted in Marketing Strategy and tagged marketing strategy, strategy before tactics. Bookmark the permalink. ← How Do You Identify Your Ideal Client?